In ancient Japan, Sakura Samurai has travelled far to master the way of the sword. He finds the ancient Sakura tree that hasn't bloomed since guardian deity Princess Cherry Blossom was kidnapped many years ago. After learning the way of the sword from kappa swordsman Master Melonbowl, Sakura Samurai sets out to rescue Princess Cherry Blossom from her captors. 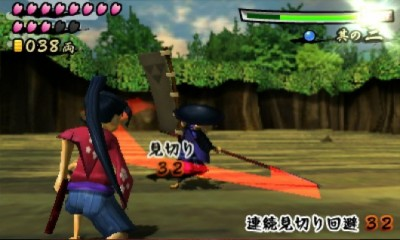 A simple action game where the A Button is used to strike and the B Button and control stick are used to dodge. Time your strikes and take out the enemies, earning money as you go. Defeat the evil Castle Lords, temper your sword and battle your way to victory.